IBPS released the official notification for recruitment of Specialist Officers, you all would have already started to get yourself ready to appear in the examination that is to be conducted on 29th and 30th of December. The bank officially doesn't release an official syllabus for the exam but we can conjecture by the questions asked in the previous years that the syllabus is really vast. It is geared towards testing an aspirant’s versatility to solve complex questions in the most prolific manner. 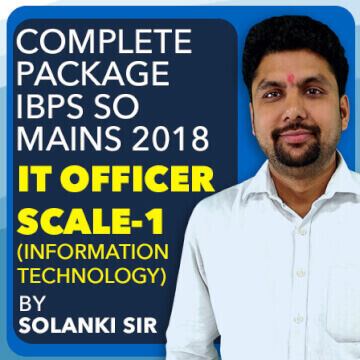 You can also Join IBPS SO Mains 2018 for IT Officer Scale-1 (Information Technology) Live Batch By Solanki Sir (Live Classes).